It’s my privilege to write a monthly poetry column over at my friend Janice Hardy’s terrific blog for fiction writers, THE OTHER SIDE OF THE STORY. My offering over there today harkens back to Notan (positive/negative shapes and such) as a simple way to think about characters in a story. 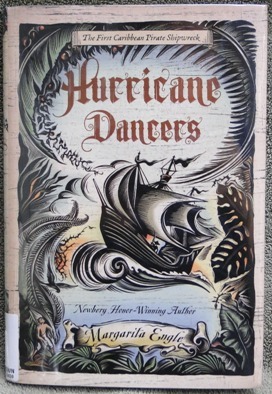 As an example, I borrowed characters from Margarita Engle’s wonderful book, Hurricane Dancers (Henry Holt and Company, 2011). 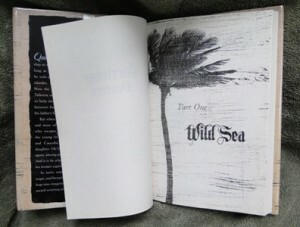 I think its cover is, like the writing, just exquisite. The jacket illustration was done by Cathie Bleck. (The Artist’s Statement on her website sings to me!) The jacket designers were Rich Deas and Elizabeth Tardiff. I don’t know what the lettering/font is called, but I’m also in love with the letters. Looks to me like blackletter with curlicues and a Western twang (with the “points” peeking out along the stems of the letters.) Very dynamic. For a treat, click here to see a video of cover artist Cathie Bleck’s artistic process using kaolin clay. Many of her incredible paintings as well as some studies and sketchbooks are posted on her site as well. Enjoy! Wherever we are in our artistic journey or career, it’s helpful to circle back sometimes to the basics. You know, those concepts that are SIMPLE, familiar even – but not necessarily easy! Recently I stumbled upon a book I’m enjoying working my way through. 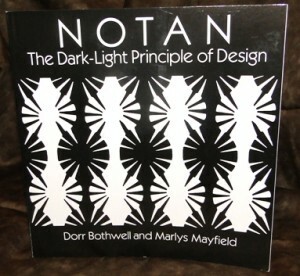 It’s a Dover (1991) republication of a book published in 1968 by Renhold Books Company: NOTAN – The Dark-Light Principle of Design by American artists and teachers Dorr Bothwell and Marlys Mayfield. It’s not a hefty volume, a paperback measuring less than 9 X 9 in. But it holds treasures! 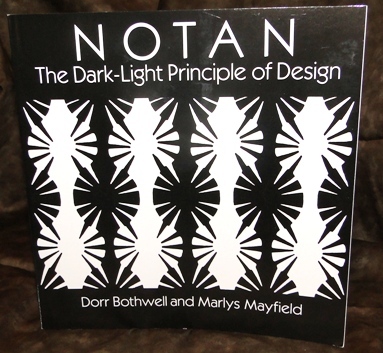 As a guiding principle of Eastern art and design, Notan (a Japanese word meaning dark-light) focuses on the interaction between positive and negative space, a relationship embodied in the ancient symbolism of the Yang and the Yin. 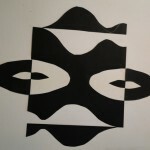 In composition, it recognizes the separate but equally important identity of both a shape and its background. I was intrigued by the book for several reasons, including my love of haiku and subsequent interest in learning more about Japanese art and design. 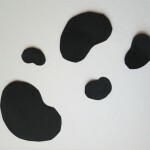 Also, my mind drifted back to explorations of “positive and negative space” in art classes in college many moons ago. I don’t remember learning the word Notan, but I remember studying similar concepts. I love to experience and create art in black and white. And, as I’ve taken up calligraphy again, practicing elements of balance, space, tension, and reversals will improve my art in that area too. A couple of my exercise pages – a bit rough, but you can see how fun they are! One sees masks emerge, no? 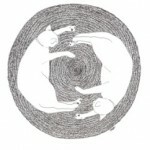 A pen-and-ink drawing I did a long time ago has been the most popular image I’ve ever drawn, and I think it’s because of its yin/yang quality – Notan, if you will. You can certainly make art with properties of Notan without ever studying the concepts or learning the vocabulary. 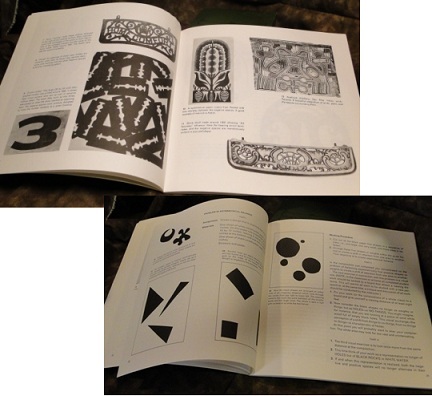 In fact, many examples in the book come from primitive or folk art. The authors contend people naturally create this way if we are not separated from nature. But if you do decide to round up a copy of the book and take the exercises for a spin, just try to make it through the day without seeing Notan all around! It will improve your composition and artmaking to boot. The book is available from online booksellers, or, better yet, maybe your favorite indie bookstore can order it for you. Easy to see while it’s still in print after all these years. I’d love to know how you work with positive and negative space, or if you have any other thoughts on this topic – won’t you leave a comment? Also, if you missed commenting in last week’s post, you can still do so and be entered to win a copy of Pam Carriker’s ART AT THE SPEED OF LIFE. One winner will be randomly chosen from comments left at that post before midnight EST Monday, Oct. 8, and announced next week.